The Endless Mountains Visitors Bureau has announced that a new booklet of activities and happenings from Spring 2019 through the end of winter 2020 is now available. The calendar covers events from April 1 through March 31 and includes a wide range of community events such as open houses, suppers, art and craft shows, fairs, festivals, and fundraisers in the Endless Mountains Region of Northeastern Pennsylvania. The printed piece is a convenient 4” x 9” booklet, making it easy to carry as you enjoy activities in Sullivan, Susquehanna, and Wyoming counties. The calendar is available at the Endless Mountains Visitors Bureau office located on Rt. 6 just west of downtown Tunkhannock, in area businesses, as well as in the bureau’s outdoor kiosks in Nicholson, Dushore, and Wyalusing. 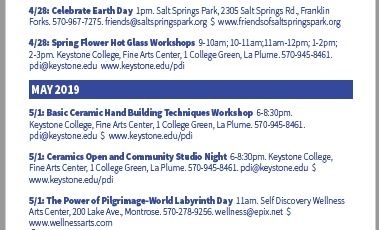 A complete listing of events can also be found on the visitors bureau website www.endlessmountains.org. Any non-profit or community organization located in the three-county region can submit events to the bureau’s website for free. The easy-to-follow instructions on the site will guide the user through the online form. The Endless Mountains Visitors Bureau is the designated tourism promotion agency for Sullivan, Susquehanna, and Wyoming counties. The bureau promotes the region as a whole, concentrating its efforts outside the region to draw potential visitors into the area for a memorable vacation, while at the same time, boosting the local economy.